This page has links to Dennis Sosnoski's recent presentations. The ones currently shown are from meetings in the Seattle, WA area in August 2014. 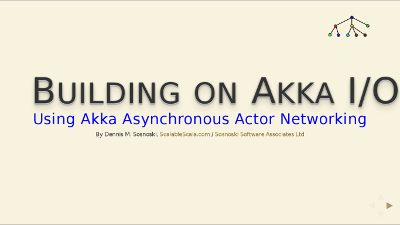 Building on Akka I/O: Using Akka Asynchronous Actor Networking is my presentation to the Scala at the Sea meetup group on 12 August 2014. This starts with an introduction to the akka.io UDP and TCP support, then shows how the TCP support can be used to build an SMTP client, including an implementation based on Akka's Finite State Machine (FSM) support. It also discusses the evolving state of the Reactive Streams Akka implementation, which is intended to provide support for higher-level protocols in the future. Click the image below to view the slide set (use mouse clicks or arrow keys to move through the slides, or scroll with your mouse wheel). 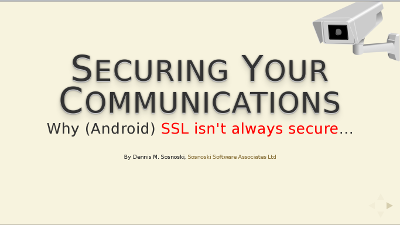 Securing Your Communications: Why (Android) SSL isn't always secure... and how to make it secure is my presentation to the Seattle Android Developers meetup group on 13 August 2014. This covers both general threats to SSL security and some Android-specific issues, including ways to improve your security by using the new Play Services ProviderInstaller API to get updated Conscrypt security code or using the open source Bouncy / Spongy Castle library to replace the platform implementation. Click the image below to view the slide set (use mouse clicks or arrow keys to move through the slides, or scroll with your mouse wheel). 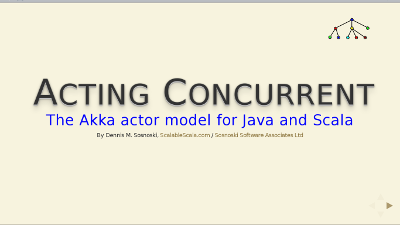 Acting Concurrent: The Akka actor model for Java and Scala is my presentation to the Seattle Java Users Group meeting on 19 August 2014. This starts with a look at Java 8 and Scala concurrency features, then moves on to using Akka actors in both Scala and Java, including discussion of retrofitting existing Java applications to Akka. You can view the full video on Vimeo. Click the image below to view the slide set (use mouse clicks or arrow keys to move through the slides, or scroll with your mouse wheel).